Kata Robata serves the best ramen in town. "Everybody’s eating ramen,” sushi chef Manabu “Hori” Horiuchi said with a bewildered smile when I sat down at his sushi bar at Kata Robata and ordered a bowl of the spicy noodle soup. He wasn’t kidding. The twenty-something Asian-Americans on either side of me at the sushi bar all had bowls in front of them. The guy to my right was visiting from San Francisco. He told me his local friends said Kata Robata had the best ramen in town. “Sort of—it’s a combination of pork and fish,” said the chef. Horiuchi isn’t all that excited about serving ramen. Sushi chefs in Japan go through three years of rigorous training, and for the first two, they aren’t even allowed to touch the fish. He’s one of the top sushi chefs in the country, a James Beard Award nominee, and he never thought he would end up slopping noodles. Asking a Japanese sushi chef to make ramen is like asking a master French pâtissier to bake brownies. 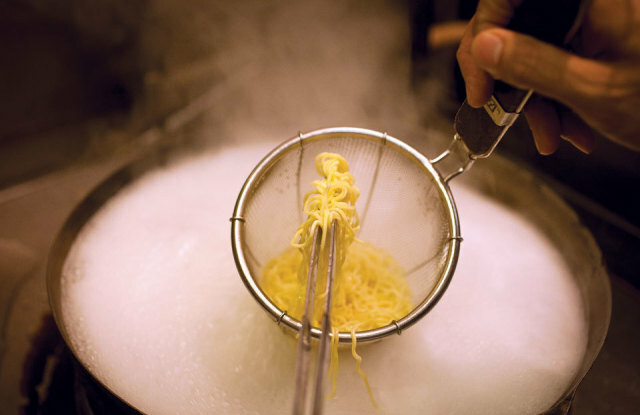 Shio, or salt ramen, is clear and light in color, and as you might imagine, it’s salty. The stockpot might contain any combination of chicken, vegetables, fish, and seaweed. Shio ramen is often combined with the dried fish flake–and–seaweed stock called dashi. Tonkotsu ramen is the Tokyo classic: a rich, unctuous, milky-colored broth made from pork bones. Served with chashu (roast pork slices), a boiled egg, and thin, straight noodles, it’s considered the meatiest of ramen styles. Shoyu ramen is a tangy, soy sauce — spiked, clear, brown broth made with chicken, fish, and vegetables, usually served with curly noodles and garnished with marinated bamboo shoots (menma), green onions, seaweed, boiled eggs, hot peppers, and roasted pork or sliced beef. Miso ramen is made with miso and chicken or fish broth, sometimes blended with tonkotsu. It comes with flavorful toppings such as spicy bean paste, butter and corn, leeks, onions, ground pork, and chopped garlic—the noodles are often thick and curly. —R. W.
Sushi takes sparklingly fresh ingredients and pares them down to their elemental essence. Japanese sushi chefs awe us with their skill at creating bold flavors without the fireworks of chile peppers or the aromatics of garlic. And they have introduced us to the subtlety of the fifth flavor, umami. But for kids who grew up on California rolls, the sushi thrill is gone. Ramen is the punk kid of the Japanese food scene. It has taken over and taught a new generation of irreverent food enthusiasts to thumb their nose at old-school elitism. The noodle soup called ramen is to the Japanese what burgers are to Americans—a hearty, inexpensive, straightforward lunch, a quick dinner, or a late-night snack after a few too many. Ramen is fast food, not meant to be eaten in a tastefully decorated restaurant. It’s served at a stall furnished with uncomfortable stools to make sure you don’t hang around too long. A complex ramen broth is often murky, sometimes spicy, and full of funky fish and seaweed flavors. There are occasional chile peppers and garlic, too. The mound of thin but chewy wheat noodles is the filling payload; beneath them, buried treasures might include roasted pork, fish cakes, and boiled eggs. Sesame, garlic, chile oil, pickled ginger, pickled bamboo, and mushrooms are a few of the likely garnishes. There are a whole lot of flavors mixed up in the bowl, and you can’t really tell where some of them are coming from—which makes ramen about as far from sushi as you can get. Early this year, when I heard Goro & Gun was opening downtown, I predicted a “ramen tsunami” would wash over the city. 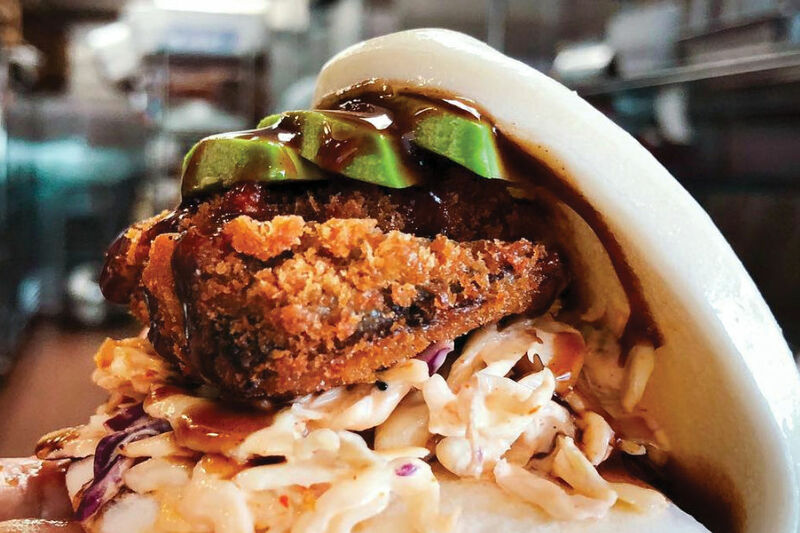 After all, co-owner Josh Martinez spent 15 years working in cutting-edge Japanese restaurants like Kata Robata here and Kenichi in Austin before he wowed the Houston food scene with The Modular food truck. 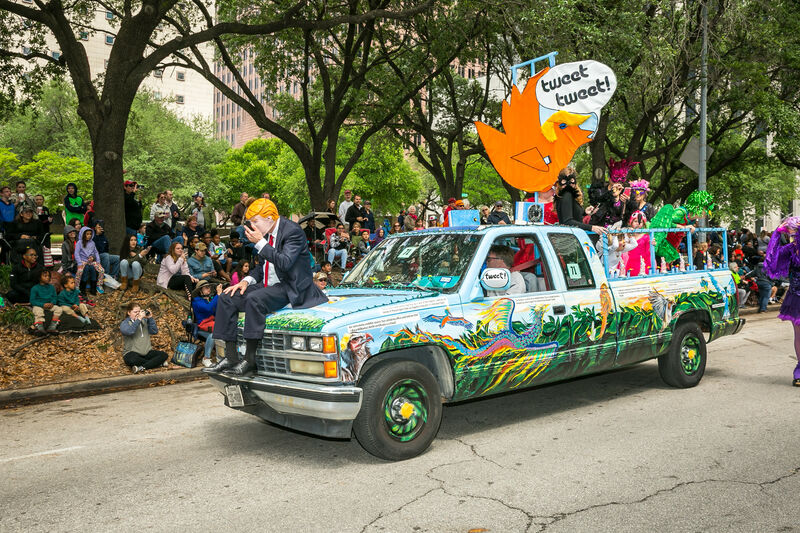 He was just the sort of young restaurant scene-maker to introduce Houston to the ramen binge that has been sweeping the U.S. for the last ten years. Goro & Gun was going to be the city’s first “ramen-ya,” as the Japanese noodle shops are known. The restaurant’s name comes from Tampopo, the Japanese movie that debuted in 1985. The movie’s lead characters, Goro and Gun, are two truck drivers who help a struggling ramen-shop owner named Tampopo save her failing soup kitchen by taking her on an educational tour of Japanese ramen shops. When Goro & Gun finally opened its doors in March, I ate the ramen and was terribly disappointed. The noodles were made in-house, but they were too thick and too hard. The pork broth was oily. Then they switched the recipe, and it started to taste like the watery ham-bone stock you use to make split-pea soup. The place was packed, the chicken wings and the brussels sprouts were tasty, and the cocktails were excellent, but Goro & Gun’s ramen sucked from day one. In May, chef David Coffman departed, and in June, chef Jason Hauck, who created the ramen menu at Soma, stepped in to help Joshua Martinez. The first thing Hauck did was send the sous chefs to Teppay on Westheimer to try the excellent Tokyo tonkotsu ramen served there. When ramen lovers complain that Houston ramen isn’t very good, what they really mean is that we lack the sort of hipster ramen shops that David Chang made famous at the Momofuku Noodle Bar in New York. 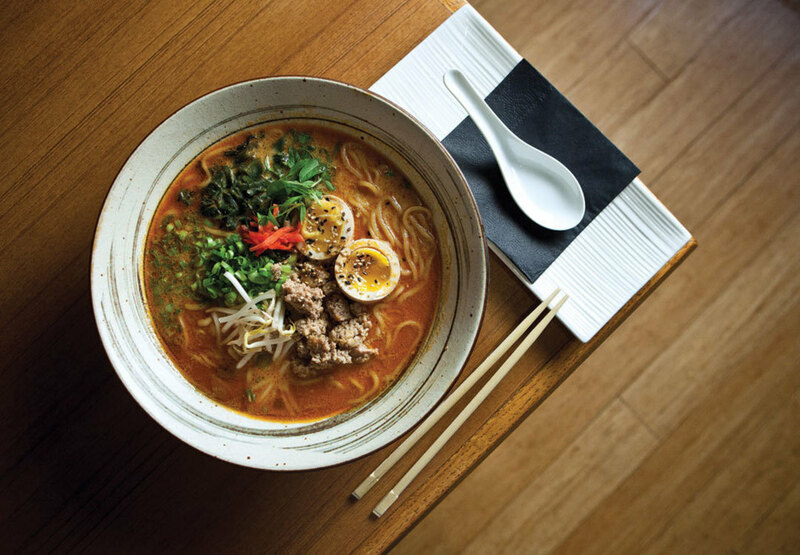 New American ramen shops aspire to serve the kind of upscale ramen called kodawari in Japan. This soup is meticulously prepared with the very finest seasonings, rare sea salts, several seaweeds, exotic dried fish flakes, seasoned fats, handmade noodles, and double broth combinations. 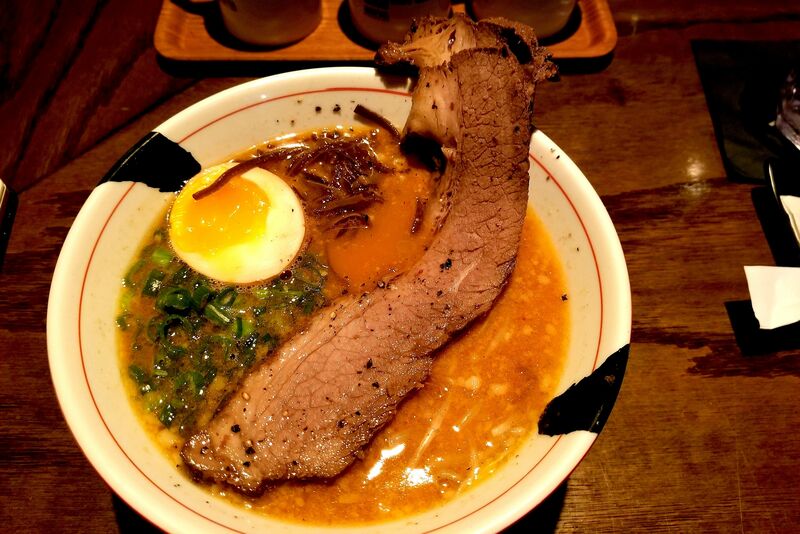 The king of this sort of ramen is Ivan Orkin, a Jewish kid from Long Island who graduated from the Culinary Institute of America, moved to Japan, and opened Ivan Ramen, which became one of Tokyo’s foremost ramen shops. Right now, American ramen is coming to a full boil with the opening of Orkin’s new ramen shop on New York’s Lower East Side and the release later this fall of his new book, Ivan Ramen, from Ten Speed Press. I got a look at the book’s galleys and I was fascinated by the interview with Tokyo’s “ramen Nazi” Shimazaki-san, a fanatic who forbids customers from talking in his restaurant. 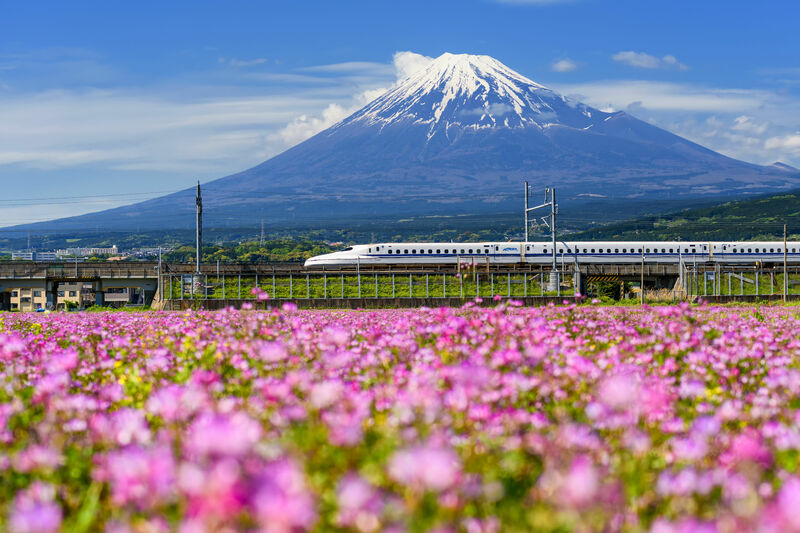 Then there is Oshaki-san, a legendary ramen critic who eats an average of three bowls a day—his lifetime total is said to be 8,000 bowls of ramen. Orkin has nothing bad to say about instant ramen noodles in his book—probably because his brand is one of the fastest-selling in Tokyo. But he is quick to dismiss the efforts of everybody else in the country. “Sure, there’s lots of ramen in America already,” he writes, “but I’ll just say it: it’s crap compared to what we’ve got in Tokyo.” In the foreword, Momofuku’s Chang warns Orkin that Americans don’t know how to eat ramen—you’re supposed to slurp the soup quickly while the noodles are still firm—and predicts that Orkin will be pecked to death by bloggers. Meanwhile back in Houston, it’s become apparent that improvements to the noodles and soup stock will never turn Goro & Gun into a ramen shop—it will remain a pleasant downtown bar with good snack food. But the ramen tsunami has started anyway. 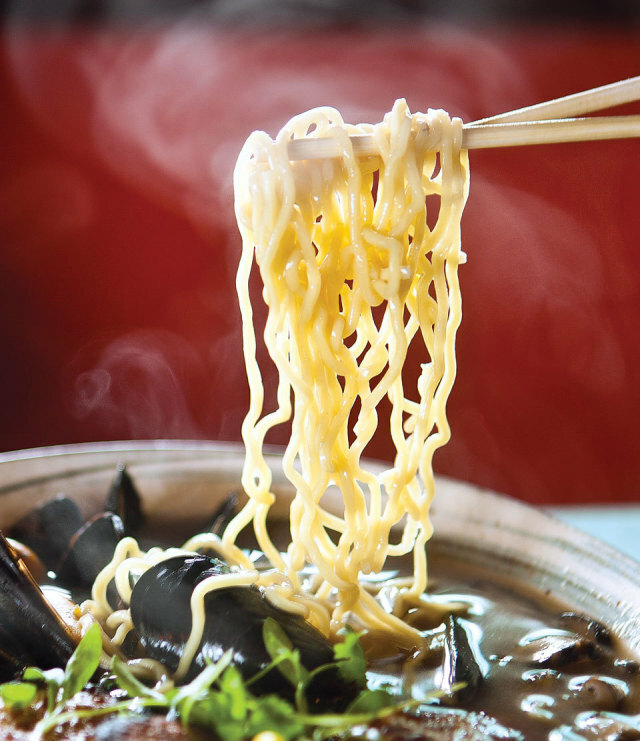 The seafood ramen at Soma Sushi on Washington Ave. just keeps getting better, and hip Asian sandwich shop Fat Bao at Richmond and Kirby has added ramen specials to their chalkboard menu. Houston’s first full-on ramen-ya is surely on its way. Tatsu Aikawa, the owner of Ramen Tatsuya, the first brick-and-mortar ramen shop in Austin, told me he’s been scouring Houston in search of a location and hopes to open a shop here soon. The Tatsuya folks are very serious about their ramen. They offer hipster affectations like “flavor bombs”—add-ons of corn and butter, Brussels sprouts, or habanero chiles. But in keeping with the Tokyo ramen-Nazi attitude, Tatsuya forbids take-out orders. The noodles would get too soggy on your way home.